In above picture, the picture demonstarte the key dimensions of socket. The user need to take care of three key dimensions: S, L and Drive Hole which will determine the usage of this socket. 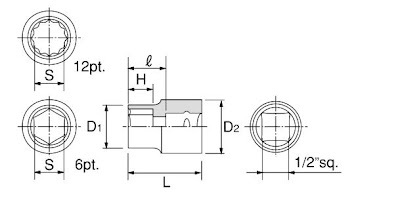 Drive hole (Square Hole) is mainly used by different torque size driver tool. For example, if you buy 1/2 inch Drive Ratchet, then you must use 1/2 inch drive socket. "L" refer to socket overall length which matters in various working environments. Some screws is into the deep hole, and deep socket will be your better choice. "S" means the target size of the nuts. For example: If you want to unscrew the 5mm nut, then you need to use 5mm socket. Why use inch? Because this is developed in British Industry Age! When you go to the hardware store, you can find the ratchet wrench or other fasten tools with the above drive hole size. The biggest drive hole carry the highest torque-resistance. The smallest drive hole can be applied into the confined space. Generally speaking, 3/8 inch (9.5 mm) is the most popular size in the auto repaired field. Currently in the market, the sockets size is divided into two systems: inch (imperial) and metric (millimeter). The sockets 6 point or 12 point are within these two systems. The popular range is 5.5~24mm. Inch is mainly used in USA and Metric is mainly used in Europe and Asia. Sockets have deep, semi deep and standard size. The user can pick up the most suitable length accordingly to the working environment. Moreover, the semi deep is designed especially for 3/8" Dr.
Tien-I as the professional manufacturer of socket and impact socket, provide the complete size of sockets and customerized metal processing part. Please contact Tien-I sales team for more informaiton.